Our unique approach to part-time training means you don’t have to put everything on hold to complete the essential NCTJ qualification. We understand your studies have to fit in around demanding work and family commitments, and perhaps even having a social life. With more than a decade’s experience of delivering part-time journalism courses, we know our flexible approach is tried and tested and the perfect way to become a fully-qualified journalist while maintaining an income. On our part-time course you study one evening a week (6:30pm-9:30pm) and Saturdays (10am-5:30pm). In consultation with our alumni, we’ve built in some flexible study weeks around Saturday lessons. We call them ‘self-study Saturdays’. At the start of the course we’ll give you a study guide which will have all your term dates. There will be a number of Saturdays where formal lessons won’t take place – instead you’ll be set work to complete in your own time at home. You can do this at any point across the week, giving you a Saturday back to enjoy. You’ll have approximately one self-study Saturday a month, but we’ll try to organise these weeks to coincide with bank holidays for example, to help your life and study balance. Our London courses have intakes in October and February. We also appreciate that sometimes it’s hard escaping from work on time, which is why our midweek sessions are flexible too. The same lessons will be repeated on Monday and Wednesday evenings – so you can attend which one suits you best, or attend both if a subject is challenging you. We have one intake a year in Manchester in October and lessons are staged on Monday evenings. Click here to download the course brochure and prospectus. Still undecided? Here’s a guide to studying part time by our course director Rachel Bull. “I’ll be honest, I have huge amounts of respect for the guys who study part time. I’m frequently accused of trying to put people off the course in interview, but actually I just want you to know what you’re getting yourself into. 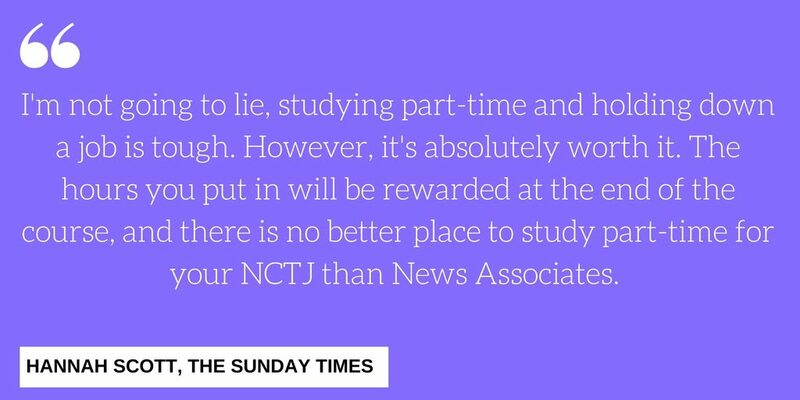 “I’ve spoken to lots of editors who are impressed by the commitment of trainees holding down a job and juggling their NCTJ – but it’s important to have an understanding of how demanding the course can be. “To be successful on the part-time course, you need to be self-motivated and have good time management skills. Some elements, such as law, public affairs and reporting, are no different depending on whether you study with us full or part time. 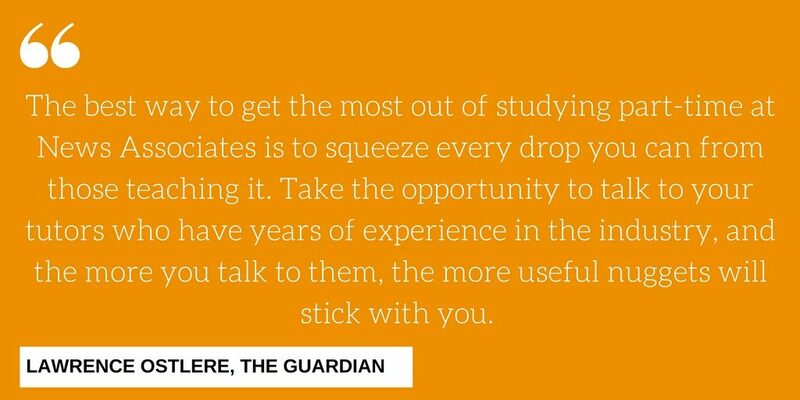 You need to be aware that exams are in the week (we’ll give you lots of notice), and revision before exams will need to be juggled around your job – but while that’s stressful, it’s normally manageable. “The hardest elements are building up your portfolio throughout the course, and my favourite subject, shorthand. “When trainees study with us full time, they are doing some form of shorthand every day. 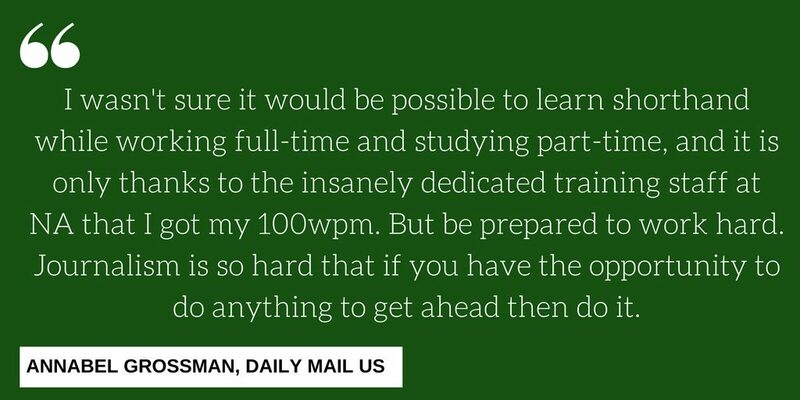 Shorthand isn’t hard, it’s just hard work – and on the part time course you’ll never pass 100wpm shorthand just being in lessons on an evening and Saturday. You need to do some shorthand every day. I normally recommend around an hour, so you need to be disciplined with how you can fit this in. 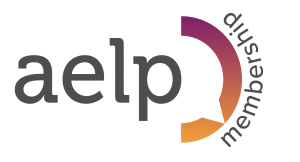 The theory can be overwhelming at the start of the course, but there is lots of support available if you need it. “The other element we’re trying to be flexible with is how you build up your portfolio. If you’re already a working journalist, you might find this aspect very easy, or you might be looking to undertake a placement in another area of the industry. “If you can take the time off work, we can work with you to organise a placement. Or, if your schedule allows, some trainees will still undertake a placement for one day a week for part of the course. Again, we can help organise a placement with you. “Alternatively if your schedule doesn’t allow you to take holiday to complete a placement, we can work with you to complete your portfolio in the evenings and weekends – but this requires discipline and commitment from you around your other commitments. We run a number of websites from our office, and there are regular opportunities to contribute to them throughout the course, but you need to factor into your time, having the ability to come up with story ideas and track people down for interview. “Another factor is video journalism. Video isn’t optional on our courses – everyone has to have mobile journalism and experience of broadcast, but there’s nothing better than putting the theory into practice. So once we’ve gone through how to shoot and edit video, you need to find the time to book out the equipment and go and work on stories outside of the course. Got a question about our part-time journalism courses? Contact us on training@newsassociates.co.uk or 0203 026 3781. 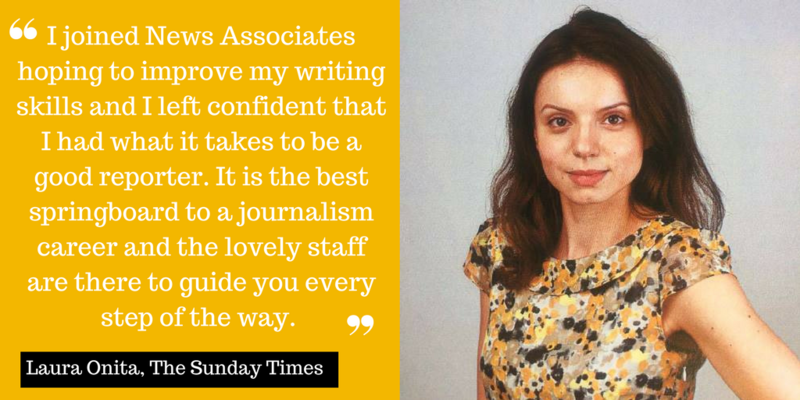 For advice from former News Associates part-time trainees click here. For frequently asked questions about our part-time course, click here. Sign up for a free journalism workshop here. Apply for our part-time journalism course here.